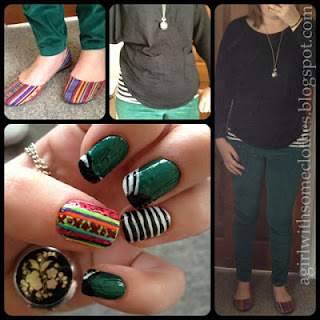 Guest post from A Girl with some Clothes - matching nails and outfit! 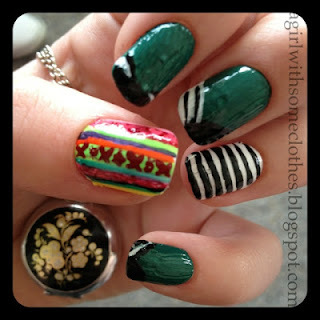 This is the very first guest post on Nailed it NZ! And considering who's doing it, it's quite fitting. I'm never quite sure what to write/photograph for "guest posts"
and the remaining fingers are based on my green cords, I actually made this green by mixing a pale khaki colour with a dark green, I then used a tooth-pick to scrape of stripes on the first layer, and then added another layer of green over-top, so if you look closely you can see the texture of the nail matches the texture of my cords. 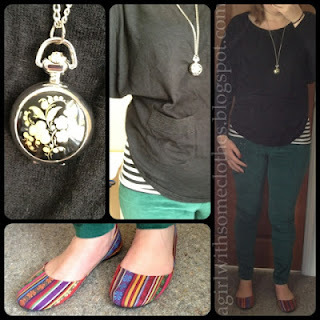 I am wearing my new Green Cords from my all time favourite shop Max, my new shoes are super funky pattern and super cheap price from K-Mart, my Stripy singlet is from Max, my comfy, yet stylish black jumper is French Connection (you can't really see but it actually has a sparkly trim...), and My New necklace (that's actually a vintage-y pocket watch) is from a market place in Foxton, New Zealand. I hope you've enjoyed reading a snippet of my style, and I look forward to seeing some of Jessie's other guest bloggers! Awesome! thanks for your support in the blogging community... and I am SO looking forward to the 31 day nail art challenge: Take Two "inspired by an outfit"! You're welcome! And I bet you are! So super cute!!! I love the rainbow stripes! Aren't they awesome? She did such a good job! Cute! I love those shoes! I think so too, and yup I'll check it out. Yeah, I don't think I've ever done this but it's an awesome idea!